General Phung Quang Thanh, Minister of National Defense of Vietnam, on June 5 delivered a speech at the fifth plenary session of the Shangri-La Dialogue, stating that Vietnam’s defense policies are directed at peace and self-defense. The fifth plenary session of the 10th Shangri-La Dialogue in Singapore focused on responding to new maritime security threats in the East Sea. 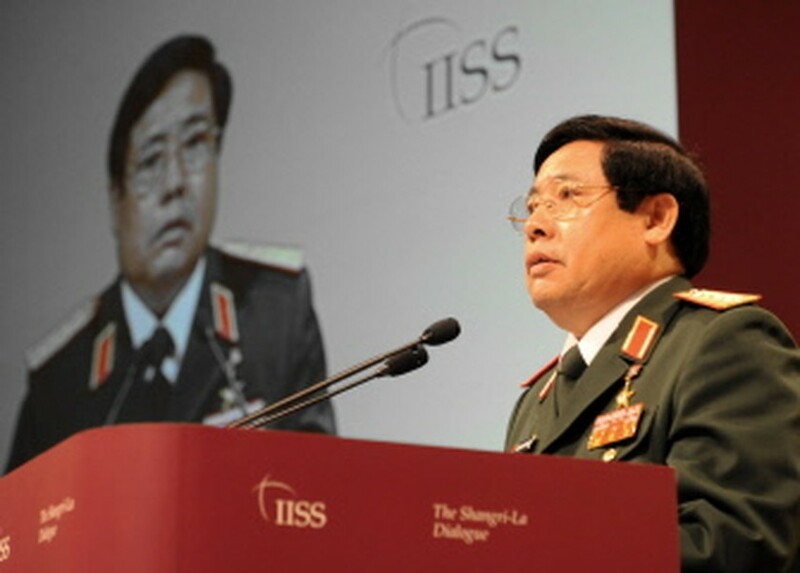 AFP - Vietnamese Defense Minister General Phung Quang Thanh speaks during the annual Asia-Pacific forum in Singapore on June 5, 2011. The Vietnamese Minister said, “Responding to New Maritime Security Threats” is really a theme of crucially topical relevance to the peace, stability and development in the region and the world. “When talking about the sea in the 21st century, we are all aware of the fact that it is the space for survival and growth, as well as the future for our modern world. This is true to both littoral and non-littoral states with or without sovereignty cross-claims. He mentioned to another striking feature of the sea in modern times that is the intensified engagement of countries in all relevant aspects with a view to securing their immediate and perennial national interests that are of vital strategic nature. The minister noted, “Against such a backdrop, relationship and cooperation in the region are witnessing a robust growth, greatly benefiting nations, region and the entire world. At the same time, there arise differences, fractions and even conflicts. That is an objective reality that we should not try to evade. Rather, we must face it boldly simply because cooperation and contradiction are the two sides of the one matter pertaining to the maritime exploitation and development. That requires us of a comprehensive perception of the global nature of the sea in the modern world. Naturally, no challenges confront exclusively to just one country. Instead, they present as common ones to all nations, directly or indirectly, who must engage one another in good faith with a view to intensifying mutual understanding and cooperation while mitigating differences, fractions and conflicts. He underscored, “First and foremost, we need to build a common and proper understanding of the values, new features, benefits as well as challenges that are shared and faced by all the nations. As the world evolves dynamically, there naturally emerges an array of non-traditional security challenges beside traditional ones. It is the diverse and intertwining nature of development and challenge, benefits and conflicts that makes it all the more necessary to enhance cooperation, both bilaterally and multilaterally to find common solutions. Secondly, it is necessary for us to strengthen our legal basis for activities at sea with an aim to facilitate cooperation for development and deter actions that risk our common interests, regionally and nationally. We must respect each other national sovereignty and territorial integrity while seeking for proper solutions to arising disputes in this respect. Above all, it is a must for us to strictly uphold and abide fully by the 1982 United Nations Convention on the Law of the Sea (UNCLOS 1982). Coming home to Southeast Asia, it is incumbent upon the concerned parties to fully implement the Declaration on the Conducts of Parties in the South China Sea (DOC) and work towards the conclusion of a Code of Conducts (COC) between ASEAN and China. Besides, common efforts to re-enforce the effectiveness of the existing arrangements such as the East Asia Summit with Russia and the US as new members, and to form up new security architectures as seen in the recently established ASEAN Defense Ministers Meeting Plus (ADMM+), reflect the need and prospective for cooperation between ASEAN and its partners sharing common interests in the region. Such mechanisms are very promising in bringing about a good future as long as ASEAN can thrive on its solidarity and unity, bringing into full play its central role and securing the harmony between rights and responsibilities with and among its dialogue partner countries. Thirdly, we have to further our maritime cooperation for development via both bilateral and multilateral channels for the sake of mutual respect and understanding. In this connection, defense cooperation has an extremely important role to play in building and enhancing trust among the militaries, ensuring the absolute no use or threat to use of force, thus preserving peace, stability, protecting peaceful labor, economic and other maritime activities. An example of success story is the Malacca Strait, where stability prevails, thus contributing to regional economic growth. In this regard, we highly value the cooperative efforts by navies of directly relevant countries including Indonesia, Malaysia and Singapore, and also the joint support of other navies inside and outside the area. Similarly, the Vietnam People’s Navy has been increasing its cooperative activities like joint patrols, establishment of hotlines of communication with navies from China, Thailand and Cambodia as well as prospective coordinated patrols with Malaysia and Indonesia. We believe that these activities should very much benefit the security and order in the East Sea (or South China Sea). Minister Thanh referred to the case of the East Sea, saying clashing incidents have happened from time to time, giving rise to concerns for the littoral states. The most recent one took place on 26 May 2011 when the Binh Minh 02 – a Vietnamese surveying ship conducting its normal oil and gas exploration activities well within Vietnam’s 200 nautical mile Exclusive Economic Zone was interrupted with its surveying cables cut, which has caused a considerable concern on the maintenance of peace and stability in the East Sea, in the region as well as the wider world. “Vietnam has exercised patience in managing the incident with peaceful means in accordance with the international laws and the principle of determinedly protecting our national sovereignty while preserving peace and stability in the East Sea, and maintaining the friendly relationship with neighbouring countries. 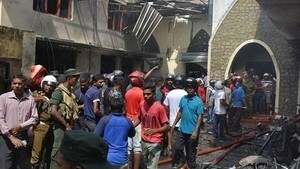 Certainly, we truly expect no repetition of similar incidents,” the Minister emphasized. “We hold the line of expanding cooperative relations to militaries both inside and outside the region for the sake of promoting mutual understanding and respect, collaborating in activities to respond to common security threats, including those from the sea,” Minister Thanh said. He affirmed that Vietnam views its national security closely linked to regional and international security and that it stands ready to be a trustworthy friend and partner of countries in the international community, further promoting confidence building, developing friendly and cooperative relationship with neighbouring countries and those in the region and the world for peace, stability and development.